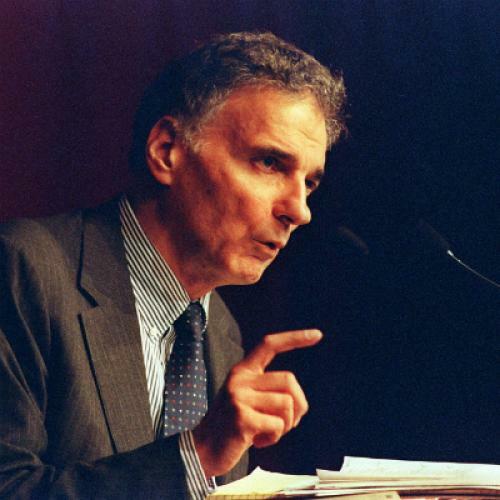 Ralph Nader, the perennial candidate, has spent the last two decades fighting to get into a presidential debate. This year, he finally got one on his own terms. All it took was sitting out the election. Last night, four long-shot presidential hopefuls, including Jill Stein of the Green Party and Republican-turned-Libertarian Gary Johnson, met at a D.C. coffee shop for a third-party debate that Nader, the moderator, promised would shatter "the conventional taboos and censorship produced by a two-party duopoly." They played along as he first led them down a game of 20 questions. The theme: Nader's favorite things. "The candidates will reply either yes, no, or pass," Nader said. "Question one: Would you favor in principle a binding national referendum process?" The panel seemed taken by surprise. "A binding 'revolution'?" Johnson, the former New Mexico governor, asked. "Meaning?" Johnson said. "I'm sorry. What do you mean by that?" As the yes/no questions became longer, more leading, and more esoteric, those unfamiliar with Nader's passions found themselves at a disadvantage. Candidates were asked if they thought the FCC should charge for the public airwaves; whether or not the military should draft by lottery; and if industrial hemp production should be legalized. There was, of course, a question about corporate malfeasance. "Do you believe that, as widely reported in the mainstream media, corporate crime, fraud, negligence and Wall Street recklessness causes more preventable deaths, injuries and illnesses and the loss of people's money, than preventable street crime?" Nader said. "I don't know," said Constitution Party candidate Virgil Goode, who, as the only social conservative at the debate, often seemed bewildered. He won the loudest laughs of the night with his views on statehood for the District. "D.C. should be part of Maryland, just like Arlington is part of Virginia," Goode said. The two liberal candidates unabashedly suggested federal intervention as a cure for unemployment. Jill Stein emphasized her Green New Deal plan, a program that would invest millions of government dollars in green businesses and renewable energy while creating 16 million jobs. I pointed out later that her plan sounded a lot like what Obama had promised in 2008. "Exactly," she said. "It was what he said, but did not do." Rocky Anderson, the former Salt Lake City mayor, called for a new "WPA-like" agency to create jobs building infrastructure—echoing Obama's own efforts to spend Recovery Act money on roads and public works. Global warming was a muted topic at the Obama/Romney debates, but took front and center at the Nader debate where both Stein and Anderson brandished their green credentials and frowned on fossil fuels. Johnson, the libertarian, sided with Romney and Obama in embracing all kinds of energy, green or otherwise, but added that rising carbon emissions could be curbed with a cap and trade system. All the candidates said they believed in man-made climate change except for Goode, who declined to answer the question. Though the candidates had presidential moments, they often undermined themselves in the next breath. Stein faltered when asked how she would pay for her Green New Deal. "It pays for itself," she said, and left it at that. Goode said he supported a diversity of energy sources, then told the audience that the future was actually in hydrogen. His comments betrayed a confusion about the difference between sources of energy, like oil or wind, and ways to store energy, like batteries or hydrogen fuel cells. In the press, Nader has backed Justice Party candidate Rocky Anderson, though he does not call it an endorsement. He later spoke warmly about all the candidates, who, despite their divergent views, were working together. "I think they're organizing themselves better, they're meeting together and maximizing exposure, whereas if they just went their own way, the mainstream media can deprecate their efforts." Tonight, Johnson and Stein will square off again in a final debate hosted by the Free and Equal Elections Foundation. Only one network will carry it: The Voice of Russia.